Goddess of Wine: Wining on New Year's Eve? Try Cheers@All Corked Up! Wining on New Year's Eve? Try Cheers@All Corked Up! Ring in a new year in a new venue that promises all the bells and whistles, along with wine, beer, live music and an outstanding menu, at Santa Clarita’s only Puerto Rican themed restaurant and wine bar: Cheers@All Corked Up. with a choice of: Arroz con Gandules ( Green Pigeon Peas), Smashed Potatoes or Grilled Fresh Vegetables. 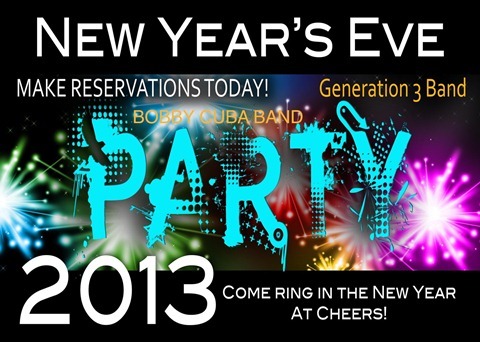 *$100 per person price includes four-course meal, two live bands, toy noisemakers and a midnight Champagne toast. *You can reserve a spot without a meal if you prefer for $50.